Bharachukki and Gaganchukki are two waterfalls which are situated in the island town of Shivanasamudram in the Mandya district. 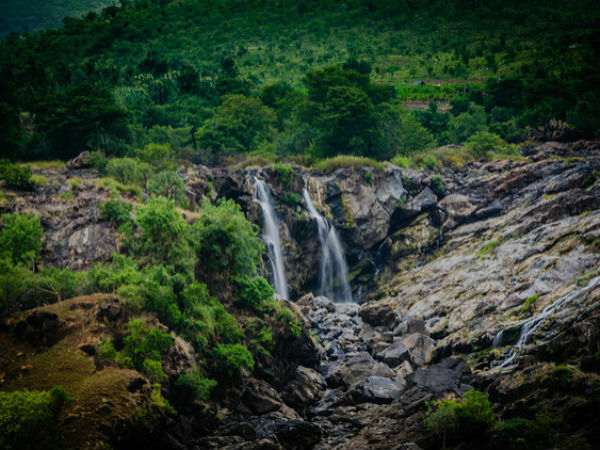 The waterfalls are born out of the river Cauvery which flows down a 75 m gorge and divides into two branches which flow through the island of Shivanasamudra. The two branches flow through a deep narrow gorge on either side of the island before breaking into two a few kilometres apart to form the Bharachukki and Gaganchukki falls. The eastern branch is known as Bharachukki and the western branch is known as Gaganchukki; both the falls together are known as Shivanasamudra Falls. By Air: The nearest airport is the Kempegowda International Airport in Bengaluru, which is approximately around 167 km away from here. By Train: The nearest major railway station is the Mysore junction which is around 60 km from here. The station has regular trains to all the major towns and cities across the state and to places around the country as well. By Road: One of the best ways to reach Shivanasamudra is by road. Kollegal is the nearest major town which is well-connected by roads and there are regular buses which operate from Bengaluru to Shivanasamudra. Those who want to opt for Route 1, it would take you approximately around 3 h to reach Shivanasamudram, via NH 75. The route takes you through the well-known towns of Ramanagara, Channapatna, Madduru, etc. The roads are well-maintained, which helps one to cover the distance at a good pace and the destination is about 131 km through this route. If you opt for Route 2, it would take you approximately 3.5 h to cover a total distance of 128 km from Bengaluru to Shivanasamudram, via NH 209. On Route 3, it would take you around 4 h to cover the distance of 168 km, via Kunigal - Maddur Road to reach Shivanasamudram. The Gaganchukki falls has a shape which resembles a huge horse's tail. It is a steep waterfall which cascades down at great velocity and gives you incredible views. The waterfall is best viewed when seen from the watch tower. The twin waterfalls have an average height of about 98 m and can be approached from two sides. Reaching the bottom of the waterfall from the watchtower is not possible as the place is fenced and visitors are not allowed to get into the water or near it. The Bharachukki is the graceful one and more popular among the two. It comes down from a height of about 69 m and is also the wider one among the two waterfalls. One can find a narrow stretch of about 200 cemented stairs which would take you to the base of the waterfall. This way is a relatively safer one which is fenced and has beaches for one to sit and relax in case you get tired. The waterfall provides you a brilliant sight to watch, especially during the monsoons when the water gushing down the rocks increases at a rapid pace. One can enjoy the beauty of the waterfall from very close quarters as there are many points where there are shallow areas where the water reaches. The best way to catch the beauty of the waterfall is to enjoy a ride in the coracle which would take you to the mouth of the beautiful waterfall. One can enjoy the mist formations as the water comes crashing down to the rock bottom, which is truly a breathtaking sight to watch. Bharachukki has a section where the water flow is lesser in volume. This section brings out the adventurer in you, as one can just stand under the waterfall and enjoy the feeling of water falling over your head. To reach this part, it is an adventure waiting for you, as the place can be reached only by crossing a narrow stream. The stream which is about waist deep has a very strong undercurrent and the river bed is a slippery rock bed, and extra caution must be exercised at all times. The waterfall can also be reached by another route which passes through a Dargah dedicated to Hazrath Mardane Gaib, from where you can get a view of the upstream end and also a closer look of the Bharachukki Falls.